The U.S. Postal Service lost $5.5 billion in fiscal 2014, though in an operational bright spot it turned a profit of $1.4 billion in controllable costs. Postal employees took the announcement as occasion to protest planned 2015 facility closures, with all four labor groups organizing protests around the county. While the agency actually grew revenue and continued to shed costs, USPS saw a net loss for the eighth consecutive year. Still, the Postal Service finished the fiscal year, which ended Sept. 30, with its strongest quarter in six years. USPS pointed primarily to the congressionally mandated payments to fund future retirees’ health benefits as responsible for the loss. The Postal Service failed to make a $5.7 billion payment into the prefunding account in fiscal 2014, after defaulting on a $5.6 billion payment last year. Labor groups on Friday reiterated their stance that legislation to remove the onerous prefunding requirements, and to cancel scheduled consolidations, would bring the Postal Service back to profitability. NALC and others planned their “national day of action” to rally against 82 processing plant closures scheduled for 2015. The Postal Service already consolidated 141 plants since 2012 as part of its “network rationalization” plan. A Government Executive analysis found USPS will shed more than 7,000 jobs because of the new round of closures, while thousands more will be offered positions at a new location. The unions highlighted revenue opportunities the Postal Service has harnessed from e-commerce as evidence the agency needs to grow its network, not shrink it. USPS grew package revenue 9.1 percent in fiscal 2014, after it jumped 8 percent in 2013. Revenue overall was up $1.9 billion in the fiscal year. The Postal Service grew standard mail revenue 3 percent and, in a rare positive sign for regular letters and postcards, revenue increased for the agency’s biggest money maker of first-class mail by 0.8 percent. USPS implemented a temporary, emergency price increase in January, which helped to boost those figures. The Postal Service also eliminated $500 million in costs, primarily by reducing compensation and benefit expenses. 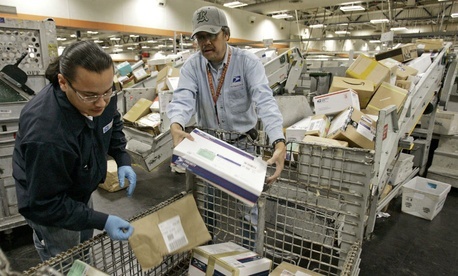 USPS cut 3 million work hours in fiscal 2014 after cutting 12 million the previous year. Despite the positive financial news -- USPS grew revenue for the second consecutive year after four years of decline -- postal officials were careful to temper the excitement. Chief Financial Officer Joe Corbett said the Postal Service is still $90 billion in the hole, as its liabilities far outweigh its assets. He also anticipated the positive momentum would not continue into 2015, citing increased labor costs, interest and the already established rate increase. Postmaster General Patrick Donahoe, who announced his forthcoming retirement Friday morning, said he sees a “bright future” for the agency, but also cautioned against celebration. “I will not say we turned a corner by any stretch,” he said.